Title: Secret of the Cosmic Box - inspired by the Cat Maru (まる)​. Limited Editions: one of 77 for each design, check out options below. Art Prints are individually printed, energized, hand singed and numbered by Ottawa artist Elena Khomoutova. Artist provides the signed Certificate of Authenticity. The Limited Edition Art Prints are museum quality collectable prints. Medium: 3 kinds of fine art giclee prints are available: on acid free paper, canvas and embellished prints on canvas. Giclee prints give you joy with most awesome colors and beautiful sharp pictures. In the art world it is generally regarded as the highest quality reproduction available. It will give you many years of joy with awesome colors. It's because prints are on one of the best HP paper, that has a special protective layer and printed with great HP inks.. We also cover prints on canvas with special protective layers from both sides of the print (top and bottom). It's unique feature, because most companies do just top protective layers or none. Water vapor could make colors to fade... if not protected from both sides. So we protect from both.... More about different kind of prints and comparison table find => here... Glowing in dark effects are available only for embellished prints. 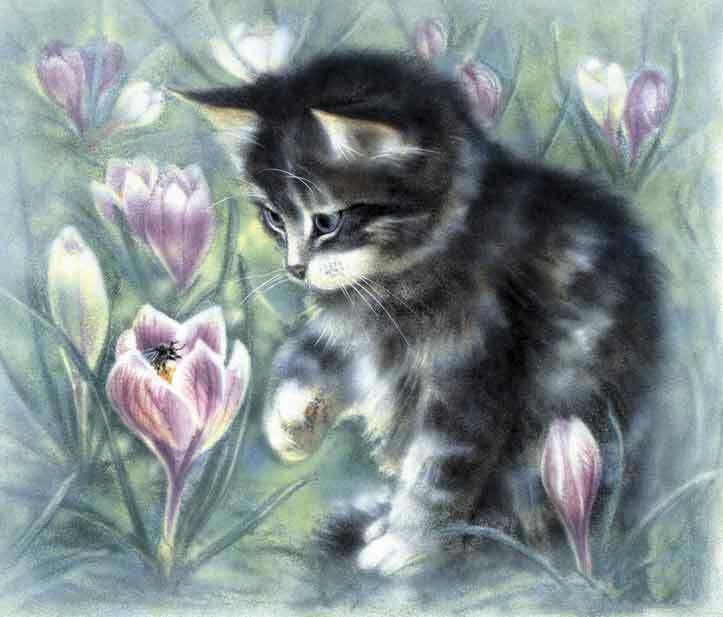 Description: The Cat Maru (まる Japanese: circle or round; born May 24, 2007) from Japan is an inspiration for the artwork. The cat is a world famous for his passion to explore boxes (日本からの猫丸が形而上学的癒しのエネルギーアートの絵画のためのインスピレーションです。彼の情熱は、ボックスを探索するために猫は世界的に有名である。). Seven similar objects and symbolic image of a hidden owl figure are on the painting. The number 7 represents a good luck and prosperity, and the owl - wisdom of Love and oneness with Creator of All That Is. Could you find seven similar objects and the owl on the painting? 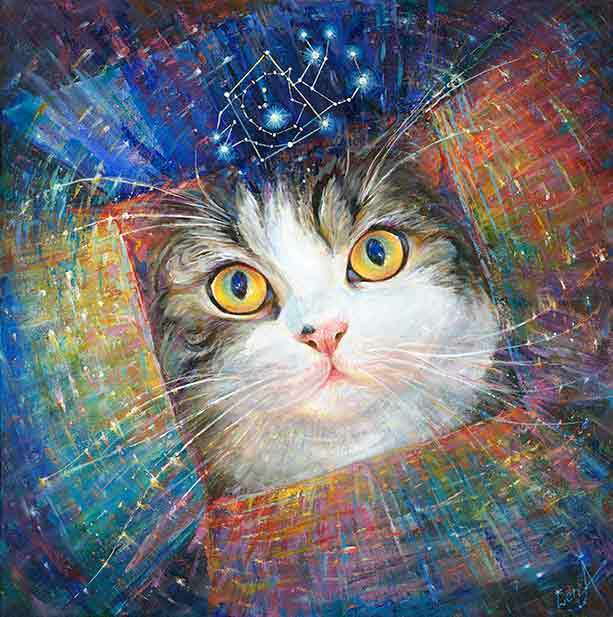 In the middle of the painting you see detailed portrait of cat looking inside the cosmic box. He contemplates the “Maru” constellation floating in infinity of the Universe. The “Maru” constellation is created by Elena based on Pleiades (Seven Sisters) constellation and surrounding existing stars. All stars are real and they are at their original locations. Elena just connected them in a new constellation and called it Maru. Look at it... Do you see the line drawing of cat Maru jumping into box? Hidden image of an Owl at the artwork suggests a thought that a big secret of wisdom could be hidden deep inside the box. Did you find it? Take a look within yourself and find your own hidden great energy, wisdom and abilities to create miracles in your life.